No. Today is not a release day. And sometimes, ONLY sometimes, does the CloudShare team decide to give you something new and cool on a non-release day. Why? Because we can, and we roll like that. Today is just such a day and you are not going to believe what we did. Even I’m thinking this is crazy. 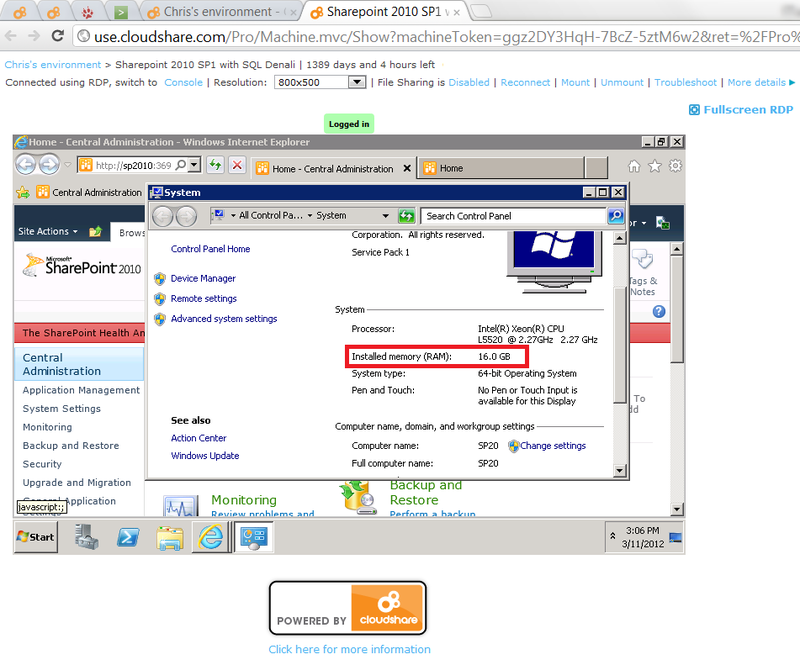 You may already know that in a CloudShare environment we limit you to 8 GB of memory per machine. This was for a very important reason. The more memory your machine has, the longer it takes that machine to resume. For example, the resume time for a Windows 7 machine with 2 GB of ram versus a single server SharePoint Farm with 8 GB, is much less. We realized that the additional resume time for more then 8GB was not worth the gain in performance a user got by adding more ram. But guess what?! Due to the efforts by our Dev and Operations team on resume performance and backend stability, and the per-machine ready feature, we have decided to give you the additional ram. Thats right, more than 8 GB per machine. I’m not talking about 1 GB. What would you say if I told you that you could have not 8, not 10, not 12, but 16GB of ram per machine!? First, you would say I sound like an infomercial, then you would hug me, right? Well you better, because that is what you get. You can now apply as much as 16 GB of ram per-machine. This will allow you to scale your environment for greater performance on those resource hog applications. There will still be a small increase in resume time for all environments that go over the 8 GB per machine, so use it wisely. This is recommeneded for advanced users only. The best practice recommended memory allocation per-machine is still 8 GB. But the memory we allocate you is yours, so use it. Increase the memory on your SharePoint server for better performance or on your Windows client machine to run more robust applications. This bump in memory combined with our ability to offer environments as large as 24 GB, and we are talking about some beefy dev environments. This update comes with a small additional change, which is in the increments of memory we allow. Before it was a sliding scale that grew as the memory you allocated grew. But now we have increased the granularity, and you can apply increments of 256 MB of memory at a time. Granularity that allows you to dial in even more how you allocate your RAM. Remember what I said about bumping memory up, well now on your AD server for example, drop that bad boy down to as low as you wish, so that you can apply the free memory elsewhere. Two big changes and much requested features have just been nailed. More RAM per-machine and more granular allocation of memory. We’ve worked hard on this and we hope you’re as excited as we are.